Al dente pasta is stirred together with fresh zucchini, tender chicken bites, yogurt, garlic and cheddar. A simple summer recipe that is so delicious and can be made quickly in your electric pressure cooker. Place chicken on the bottom of the Instant Pot. Pour in the broth. Lightly salt and pepper the chicken. 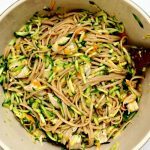 Break the linguine noodles in half and place them in a pan* that will fit inside your Instant Pot. Cover the noodles completely with water (I used 3 cups water). Use a sling or a trivet to lower the pan down on top of the chicken breast. Make it as level as possible. Cover the Instant Pot and secure the lid. Make sure valve is set to sealing. Set the manual/pressure cook button to 10 minutes for thawed chicken or 12 minutes for frozen chicken on high pressure. While the chicken and pasta are cooking, mince the garlic, shred the zucchini, grate the cheese and get out the rest of the ingredients. When the time is up let the pot sit there for 10 minutes and then move the valve to venting. Use hot pads to carefully remove the pasta pan. Drain any remaining water off the pasta with a colander (my whole wheat pasta soaked up almost all 3 cups of the water). Set the pasta aside. Place the chicken on a cutting board and cut it up into bite size pieces. Discard the broth from the Instant Pot. Turn Instant Pot to saute function. When the display reads HOT add in the olive oil. Swirl the pot around. Add in the minced garlic and saute for just about 30 seconds. Then add in 1/4 of the zucchini. Stir to coat the zucchini with the oil and the garlic. Stir in the rest of the zucchini and cook until tender, about 2 minutes. Turn off Instant Pot. Get out a large serving bowl. Turn the zucchini into the bowl. Toss in the drained linguine and the chicken. Stir in the yogurt, salt and pepper and cheddar. Toss to coat the noodles. Taste test and then add more salt and pepper to your liking. Serve immediately. Store leftovers in an airtight container in the refrigerator for up to 3 days. I used my 6 quart Instant Pot Duo 60 7 in 1*. When it comes to zucchini, bigger is not better. Choose small zucchinis. They are more tender and have a much better taste. To measure my pasta and chicken I use a digital scale*. To make gluten free: Check your broth to be sure it does not contain gluten. Replace whole wheat noodles with gluten-free noodles and reduce the cook time by 1 minute.